Resources for researching history from 400 to 1500. The databases and websites listed on this page are good sources for primary sources from the Middle Ages. Make sure also to consult the next tab on primary sources in books. 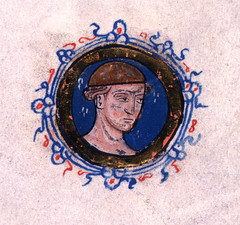 At right: Portrait of 13th century landowner, circa 1240, from the UK National Archives via Flickr. Archives images of medieval and renaissance manuscripts that unites resources from many institutions into an international tool for teaching and scholarly research. Features digitized medieval manuscripts of important European travel writing from the later Medieval period, focusing on travels from Europe to the Holy Land, India, and China. Includes travel maps. These digital libraries and websites contain excellent collections of digitized and scribed materials. At right: a page from a 13th century Abbreviatio (abridgement) of Domesday Book, from the UK National Archives via Flickr. Digitized manuscripts, charters, incunabula, local histories of the Palatinate, university documents, etc. from the University's collections. Manuscripta Mediaevalia provides at present access to to more than 75,000 manuscripts from medieval Europe, mostly held in German libraries. The website is in German. A web portal to medieval manuscript collections held in Austrian libraries. In German. General access point to all digital collections at Oxford University. Digital facsimiles of complete manuscripts held at Oxford University and not just limited to the Bodleian holdings. 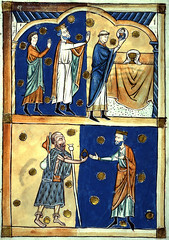 The 'Digitised Manuscripts' section of The British Library website provides access to fully digitised manuscripts held at the Library and their descriptions. The Royal Library in Copenhagen publishes selected parts of its collections on the Internet. Since 1997 the Manuscript Department has published complete digital facsimile editions of manuscripts. Offers public domain photographs and other photographs from national and international libraries, museums, archives, and cultural institutions.